Shiny 2" desk embossing seal. New revolutionary mechanism reduces embossing effort by 30%. Re-inforced, high strength steel ensures quality, durability and rigidity. 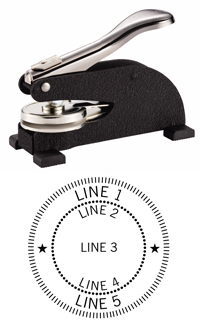 The handle has a soft rubber grip that makes the embosser more comfortable in your hand. Rubber feet stabilize this desk embossing seal. This seal is for standard plain text. If you are looking for a logo embossing seal please click here.